Okra is a green, flowering plant grown in tropical and temperate regions throughout the world. In the U.S., okra is commonly grown in the south and northward into the mid-Atlantic. The okra plant produces green, edible, oblong seed pods that grow up to seven inches long. Also referred to as “gumbo” or “ladies’ fingers,” the plant is important across the globe due to its high nutritional value and versatility – all parts of the plant can be used, including the fresh leaves, flowers, pods, stems, and seeds. Okra is low in calories but high in fiber, minerals and vitamins that promote digestion as well as heart and bone health. 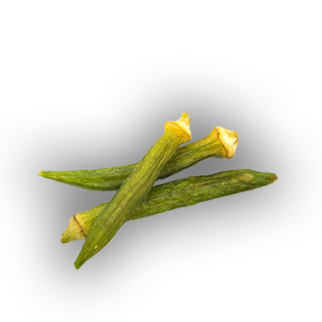 Red River’s Okra pods are dried and vacuum-fried for a crunchy, healthier alternative to potato chips or crackers.